Especially for our AntiDUST customers we have developed tools to apply our tape quickly and perfectly. The proper application of the AntiDUSTtape will ensure that the polycarbonate or acrylic sheet will retain its clarity for years to come! Having an efficient production process is important for you and your customers. So for large users of multi-wall panels we developed special tape dispensers. This way you can process your sheets much faster. During unwinding the protective siliconised release liner is removed and wound up as the product is applied thus leading to a cleaner work environment. 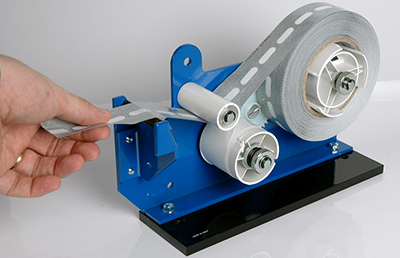 There are a series of guide wheels that fold and press the tape to the multi-wall sheet. The dispenser can be used on various widths of tape and it has a sharp knife for effective cutting when you have applied the tape to its correct length. We can offer you a table dispenser and a handheld tape gun. They have a number of clever features designed to aid you in an efficient proces of applying your AntiDUST tape. We like to think of you as a partner in our business and our goal is to work with you, listen to your needs and develop complimentary products that will improve your ability to process your panels quickly and effectively. The main advantage of using the masking stripper is that it allows removal of the correct amount of protection film to give you access to apply the breather tape. If too much protection film is rolled back the panel risks being damaged on its way to the site where it will be installed. 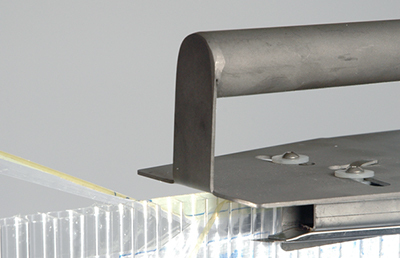 We have made a short demonstration video below for you to see the Masking Stripper in action. It is a simple but effective tool that speeds up the throughput of panels in your factory saving you time and ultimately money.